What is endovascular aortic aneurysm repair? Endovascular aortic aneurysm repair fixes an aneurysm in your aorta. An aneurysm is a weak or bulging part of a vein or artery. 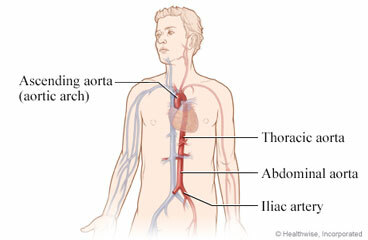 Your aorta is a large artery. It carries blood from your heart through your belly to the rest of your body. If you don't fix this problem, your aorta could burst. And this can cause death. Your doctor will use a special man-made tube to fix your aorta. This is called a stent graft. After the procedure, your blood will flow through the stent graft. It will not push on the aneurysm. To do the procedure, the doctor makes two cuts in your groin area. These are called incisions. Then the doctor puts small tubes into the arteries in that area. The tubes are called catheters. The doctor first uses the catheters to put dye in your arteries. The dye makes your aorta show up on X-rays. Next, the doctor uses wires inside the catheters to move the stent graft through the arteries and up to your aorta. After the stent graft is in place, the doctor takes out the catheters and wires. Then he or she uses stitches to close the incisions. You will have scars that fade with time. You will probably spend 1 to 3 days in the hospital. You may be able to return to work and many of your daily activities 1 to 2 weeks after the procedure. Understand exactly what procedure is planned, along with the risks, benefits, and other options. Your doctor will tell you which medicines to take or stop before your procedure. You may need to stop taking certain medicines a week or more before the procedure. So talk to your doctor as soon as you can. Follow the instructions exactly about when to stop eating and drinking. If you don't, your procedure may be cancelled. If your doctor told you to take your medicines on the day of the procedure, take them with only a sip of water. You will be kept comfortable and safe by your anesthesia provider. You will be asleep during the procedure. The procedure will take about 1 to 4 hours. You will be given more specific instructions about recovering from your procedure. They will cover things like diet, wound care, follow-up care, driving, and getting back to your normal routine. Enter L357 in the search box to learn more about "Endovascular Aortic Aneurysm Repair: Before Your Procedure".